St. Lucia is the sort of island that travellers to the Caribbean dream about--a small, lush tropical gem that is still relatively unknown. 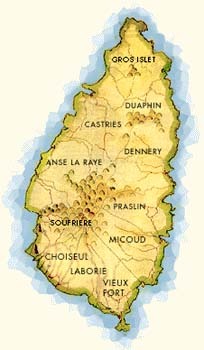 One of the Windward Islands of the Lesser Antilles, it is located midway down the Eastern Caribbean chain, between Martinique and St. Vincent, and north of Barbados. St. Lucia is only 27 miles long and 14 miles wide, with a shape that is said to resemble either a mango or an avocado (depending on your taste). The Atlantic Ocean kisses its eastern shore, while the beaches of the west coast owe their beauty to the calm Caribbean Sea. In natural beauty, St. Lucia seems like an island plucked from the South Pacific and set down in the Caribbean. Its dramatic twin coastal peaks, the Pitons, soar 2,000 feet up from the sea, sheltering magnificent rain forests where wild orchids, giant ferns, and birds of paradise flourish. Brilliantly-plumed tropical birds abound, including endangered species like the indigenous St. Lucia parrot. The rainforest is broken only by verdant fields and orchards of banana, coconut, mango, and papaya trees. St. Lucia has been inhabited since long before colonial times, and its cultural treasures are a fascinating melange of its rich past and its many different traditions. The island's people have earned a well-deserved reputation for their warmth and charm, and the island itself is dotted with aged fortresses, small villages, and open-air markets. There is a broad array of exciting and exotic activities available on St. Lucia. The island's steep coastlines and lovely reefs offer excellent snorkeling and scuba diving. The rainforest preserves of St. Lucia's mountainous interior are one of the Caribbean's finest locales for hiking and birdwatching. Of course, the island also possesses excellent facilities for golf, tennis, sailing, and a host of other leisure pursuits. Not to be missed is St. Lucia's Soufriere volcano, the world's only drive-in volcanic crater. This page, and all contents of this web site are Copyright (c) 1996-2015 by interKnowledge Corp., New York, NY. All rights reserved.